Alvechurch & Hopwood Cricket Club is repairing the damage and looking ahead to summer. After months of unrelenting rainfall, it’s hard to believe that the new English cricket season is imminent. 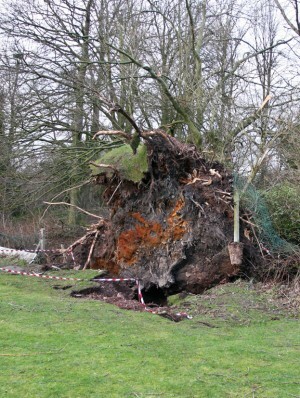 This is particularly the case for Alvechurch & Hopwood Cricket Club which, even before the season starts, has to contend with restoring the clubhouse at its second ground in Hopwood following significant damage from the winter storms – as well as working with the parish council to resolve the uprooting of the giant landmark ash tree (pictured) at its main Birmingham Road ground. Nevertheless, with four senior Saturday sides in the Worcestershire and Cotswold Hills Leagues and a thriving youth section providing competitive cricket for kids from Under 9s right through to Under 16s, there is plenty of opportunity at Alvechurch this summer for anyone interested in “wielding the willow” or “turning their arm over”, whatever their age or ability. Indoor nets for under 14s have already started but anyone aged 15 or above can avail themselves of Alvechurch’s offer to prospective new members: why not attend one of the free senior indoor net sessions and come along for free pre-season drinks to find out more about the club? Anyone interested should contact Nick Jones on 07779 267609 for more details. Alvechurch & Hopwood Cricket Club, which has ECB Clubmark status, is also looking to appoint a senior club coach for 2014 to continue their playing career in the first team but principally to oversee the training and coaching of both the senior and youth sides, working with the club’s four existing Level 2 junior coaches. The club would seek to agree attractive financial terms for such an engagement so that a suitable time commitment can be obtained. The opportunity may suit someone who is a qualified coach at Level 2 standard or above and is currently playing cricket at Warwickshire or Worcestershire League 1 or 2 standard, and wishes to take a step down as a player to develop his or her own coaching skills. Interested parties are encouraged to call Club Chairman, Mike Gilmour on 07790 668 237, to discuss this opportunity in confidence. On a separate note, following local feedback, the club will be opening during the afternoon of Saturday fixtures and hopes to see more locals enjoying a drink while watching games unfold. Overall bookings and hire of the Pavilion have grown since the Party in the Park back in 2012, and Pete Gwilliam would be delighted to discuss how the club might meet the needs of anyone seeking a regular meeting place or a party venue. Pete can be contacted on 07960 550884. This summer – once the water levels have subsided! – promises to be a great one for youth cricket at Alvechurch & Hopwood Cricket Club. Beginning on Sunday April 27 there will be regular open mornings (10am to 12 noon) for anyone under 11 who wants to learn the game or see if the club offers the chance for them to progress. The club is always keen to hear from prospective new players, so again, anyone keen to hit the season running should contact Nick Jones on 07779 267609 for further information. The club also runs an annual golf tour to Cheshire, a cricket tour to Newquay and a race day at Cheltenham as well as hosting numerous social events – so even if a future England cricket career doesn’t beckon, get in touch to fill the gaps in your social diary!